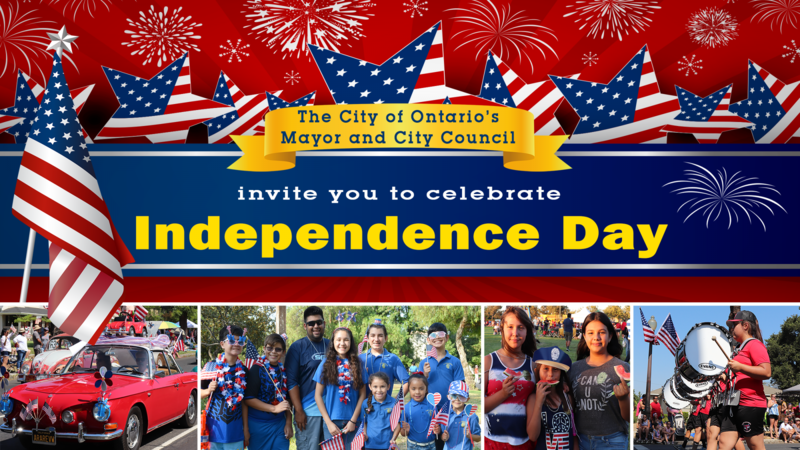 The City of Ontario Looks Forward to Celebrating the Fourth of July with You! Remember: NO personal belongings or items can be placed in the public right-of-way or median to reserve spaces prior to 5 AM on July 4, 2019. This will allow City staff the ability to prepare these areas for the parade. Thank you! Applications will be accepted until May 10, 2019 (early bird registration ends on April 5, 2019). To apply to participate in the parade download and print the application form below, fill out all required information and drop off the application at the Armstrong Community Center, located at 1265 S. Palmetto Avenue. For additional questions or more information, please call (909) 395-2020. When can I set up a lawn chair and personal belongings for the parade? Where does the parade begin and end? The parade begins at Fourth Street and Euclid Avenue and proceeds south to Euclid Avenue to B Street. When does the parade end? What streets will be closed to the public? Where can I park my vehicle for the parade? Spectators may park on any side of the street south of Fourth Street or on the West or East side of Euclid. Unless streets are listed as closed. Is there handicap parking available for the parade? There is no designated handicap parking on the streets. Spectators with a handicap placard may be dropped off on any side street south of Fourth Street at Euclid Avenue. Driver will then need to locate parking. When does the Blast at the Ontario Town Square begin? Blast at the Ontario Town Square begins right after the parade at approximately 10:30 AM. There will be a selection of patriotic music to be enjoyed. Where is the Fireworks Show? What streets will be closed to the public for the Fireworks Show? Riverside Drive between Archibald Avenue and Vineyard Avenue will be closed beginning at 3:00 PM. Where is parking available for the Fireworks Show? Parking is available at Whispering Lakes Golf Course. To enter Whispering Lakes Golf Course, take Vineyard Avenue south to Riverside Drive and make a left turn. Golf Course is on the left. Shuttle transportation is available from the Ontario Police Department, 2500 S. Archibald Avenue, to Westwind Park beginning at 4:00 PM and concludes at approximately 10:00 PM. Is disabled parking available for the Fireworks Show? With a handicapped placard, there are minimal spaces available at Westwind Park. What time will the entrance gate open at Westwind Park? The entrance gate will open at 5:00 PM. What kind of BBQ’s are allowed in the park? Only Propane BBQ’s are allowed. What else is permitted in the park? Blankets, lawn chairs, ice chest and Ez-ups are permitted. What is not permitted in the park? No dogs, alcohol or charcoal BBQ’s are permitted. What activities will be in the park before the Fireworks Show? Live entertainment will be performed by the band ACE beginning at 6:00 PM with atmosphere entertainment performing throughout the park. Carnival games, bouncers/small rides and food vendors are available at minimal cost. What time does the Fireworks Show begin? Fireworks show begins at 9:00 PM and ends at approximately by 9:25 PM. What radio station simulcasts the music for the Fireworks Show? KOLA 99.9 broadcasts patriotic music during the Fireworks Show.